Welcome to 'Season Match - Puzzle Adventure'! Here you will find: nice characters, a plot full of unexpected twists to the restore the magical kingdoms after attack the evil Witch Crow and wonderful match-3 levels! • Hundreds of original levels with fun and attractive gameplay. • Explore stunning magical world with characters who will become your friends, meet with everyone! • Dozens of unique amulets to improve your abilities! • A lot of the Magic Kingdoms, each with its own history! 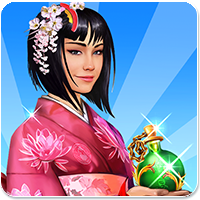 • In each kingdoms can be improved fountains and flowerbeds, giving additional bonuses! • Exciting game events will not get bored even experienced players! • Find the key of the Season Match with your friends from Facebook and defeat them all! 'Season Match - Puzzle Adventure' is a completely free game, all levels can be passed without any additional purchases. But you can always buy extra lives, moves and bonuses to achieve the most impressive results.